D Gray-Man Wallpaper: I Remember. 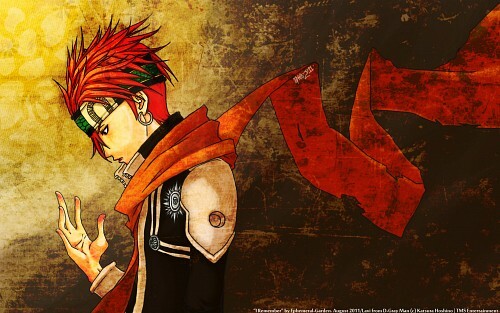 Minitokyo »	D Gray-Man Wallpapers » D Gray-Man Wallpaper: I Remember. I was trying to compile my artworks for my showreel and found out that this work was not showcased anywhere else but Facebook, gah. I did this back in August 2011, when the man said he wanted to do an art trade; he wanted Lavi from D-Gray-Man and I requested for 15! Lambo from Katekyo Hitman Reborn. It was also during this time when I got to listen to Bang Yongguk's "I Remember" featuring Yoseob and was captivated by the melody and the lyrics. So with this song on replay, I sketched Lavi looking depressed as oppose to his cheery self as often depicted in the anime (I'll be honest, I never watched D Gray-Man :P) and this pose came up. This pictured can also be explained as his desire to be a Bookman but he's struggling to reach that goal while being so very attached to the Black Orders. - Character drawn and cleaned in Paintool SAI, painted and edited in Photoshop.